I know that most BIG cities in the world have their not so pretty sides. (I hear Singapore is the exception.) Areas where it’s not safe to walk at night, low income areas, graffiti, trash. The visions of a beautiful Rome, especially for the romantic traveler, are held so closely and so dear, that we tend not to see, or don’t want to see, that which doesn’t conform to our ideal. So just for a tiny dose of reality today, I present to you a few snapshots of another Roma that I see daily. I’m not sure exactly what it is. 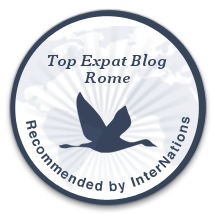 Certainly living in Rome and being so close to Vatican City has something BIG to do with it. There must also be something about the time of year. It’s once again the Jewish High Holy Days, the time between Rosh Hashanah and Yom Kippur. Last year at this time, I found myself visiting some of the major basilicas in Rome, including St. Peter’s and writing about it. So how did I celebrate the Jewish Holidays this year? Why by attending an Audience with the Pope! Pope Francis – I prefer the Italian Papa Francesco or Il Papa – has proven so far to be fascinating, and I have been fascinated by him. I’ve got to admit, I’ve never been that interested in the goings-on of the Catholic Church. But being in Rome when he was elected has made him and the Church more interesting to me. Papa Francesco is the 266th Pope. He is the first South American to be elected Pope of the Catholic Church (his parents were Italian, though). He is also the first Jesuit to ever be elected. He has already in the short time since his election in March of this year shaken up the Church and the traditions which surround the Pope. He refuses to live in the papal apartments, instead residing in a guest house within the Vatican. He won’t wear the traditional ornate vestments worn by Popes in the past, preferring simpler vestments void of ornamentation. He came “out” so to speak and said that a homosexual orientation was not a sin. This week, the New York Times ran an article about him which you can read here, talking about how he’s been calling parishioners who have written to him, something no Pope has ever done in the past. A friend of mine who works for Radio Vaticana said that it’s much more challenging to work with him than the previous Pope. He speaks more off the cuff and often doesn’t often use a script, which makes reporting on what he says more difficult. Like she has to pay attention now, which wasn’t always necessary with Pope Benedict, who kept to the script which was made available to reporters prior to him speaking publicly. I think you just gotta love him. For trying to shake up a very old tradition. For his humility and warmth. So I wanted to see him. On some Wednesday mornings, he holds a Papal Audience. When the weather is nice, it’s held outside in St. Peter’s Square. There are seats available and tickets are free, but you must get them beforehand and then cue up early to get a seat. Cue up the Italian way, in what resembles a mob scene, not the polite kind of queuing that the English do. And by early, like 3 hours before he arrives. I bought tickets for Michael and I through a tour operator called Viator, which provided the services of a guide who would help us get good seats and then give us a history lesson while we waited. Our guide, Sen, a history professor in Rome who’s from New York, knew a good spot where we could see the TV screen and see Il Papa when he went by. The Square is divided into sections with walkways where Il Papa can ride by and greet and bless those in attendance. It was exciting to see him up close. We were within feet of him when he passed by and Michael was able to get these great photos. He stopped often to kiss babies handed to him by his security service, or to offer a greeting or blessing. After going around the Square, he sat in an unadorned chair on a stage set up close to the entrance of St. Peter’s. Groups of pilgrims who had travelled from all over the world to see him were acknowledged. He presented a teaching which was translated into a number of languages about loving the Church as you would love your Mama. A children’s choir sang. It didn’t rain despite the cloudy skies and weather forecast. And I was blessed by the presence of the Pope. Not bad for a Jewish farm girl from Illinois!